We present a comparison between two recent approaches to the harmonic similarity of musical chords sequences. 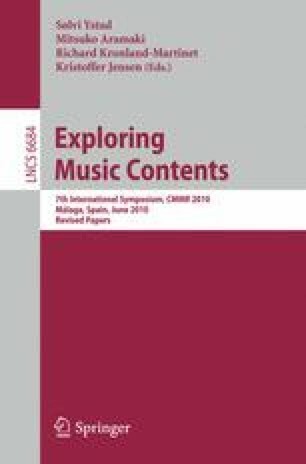 In contrast to earlier work that mainly focuses on the similarity of musical notation or musical audio, in this paper we specifically use on the symbolic chord description as the primary musical representation. For an experiment, a large chord sequence corpus was created. In this experiment we compare a geometrical and an alignment approach to harmonic similarity, and measure the effects of chord description detail and a priori key information on retrieval performance. The results show that an alignment approach significantly outperforms a geometrical approach in most cases, but that the geometrical approach is computationally more efficient than the alignment approach. Furthermore, the results demonstrate that a priori key information boosts retrieval performance, and that using a triadic chord representation yields significantly better results than a simpler or more complex chord representation.